A major donor to Gov. Greg Abbott sought and received help from the office of the governor after complaining that Democrats and their top contributor were on the verge of defeating a controversial bill insurance companies wanted. A major donor to Gov. Greg Abbott received an immediate offer of help from the office of the governor after complaining that Democrats and their top contributor were on the verge of defeating a controversial bill insurance companies wanted, records obtained by The Texas Tribune indicate. Texans for Lawsuit Reform (TLR) and Weekley have given Abbott at least $720,000 since 2001, records from the Texas Ethics Commission show. The email was provided to the Tribune, which requested copies of emails sent by Abbott himself. So was it indeed the governor who responded to Weekley? Without explanation, the governor’s office blacked out identifying information about the sender, so it’s impossible to know with absolute certainty. The governor’s press office did not respond to questions via email or phone and has previously declined comment on the trove of emails obtained by the Tribune. Jason Embry, a spokesman for House Speaker Joe Straus, said the Republican House leader "doesn't discuss his private conversations with the governor — even the conversations that didn't happen." Embry did not elaborate. Democrats predictably pounced on the email. Texas Democratic strategist Matt Angle said it demonstrates Abbott is going to bat for donors instead of ordinary Texans. 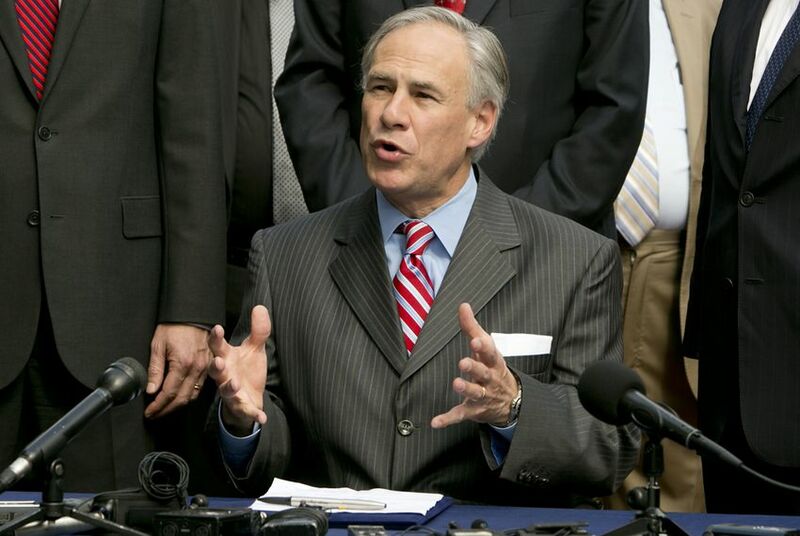 “Greg Abbott only gets fully animated when he is in a position to help a donor or a political supporter,” Angle said. At issue was Senate Bill 1628, which would have erected hurdles for homeowners and businesses that wanted to sue insurance companies that don't deal with them fairly, or don't adequately pay out on claims made under property and casualty insurance policies, such as losses after a storm, fire or accident. Whatever Abbott did to help TLR and Weekley, it didn’t work. The legislation died in committee in the final days of the recently concluded session after a wide swath of business interests — from oil and gas companies to auto dealers — said it would weaken their insurance policies and put them at a disadvantage in disputes over property damage claims. Sherry Sylvester, a spokeswoman for TLR, said the urgent tone of the email shows Weekley was concerned about homeowners who she said are losing coverage amid frivolous lawsuits filed by trial lawyers seeking to cash in on hailstorms in Texas. 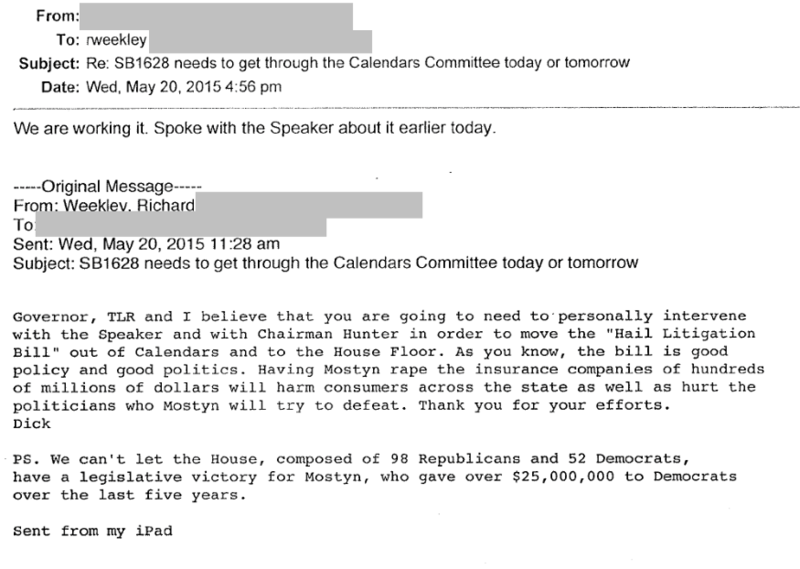 Mostyn said the email revealed a major flaw in TLR’s strategy, contending that the relentless focus on him instead of the policy doomed the legislation. Disclosure: Steve Mostyn was a major donor to The Texas Tribune in 2010. A complete list of Tribune donors and sponsors can be viewed here.